Inside: Get some inspiration for what to wear this month with these 15 October Outfit Ideas. Thank you so much for all of your responses to the new What to Wear This Month series! I’m having so much fun with this series and I hope you are too. Last month, I shared some poncho outfit ideas, outfit ideas with scarves and a few utility jacket outfit ideas. Did you have a favorite? I’ve been getting quite a bit of wear out of my utility jacket this year and have been experimenting with more ways to wear it. You can see how I paired my utility jacket with ripped jeans, sneakers and a tassel necklace here. 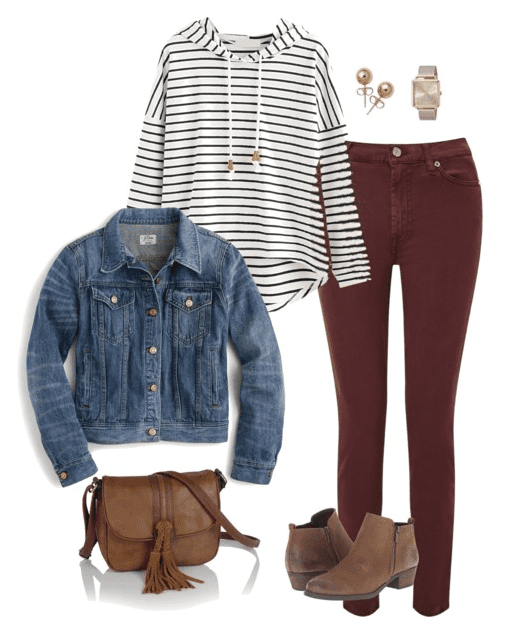 The great thing about last month’s outfit ideas is that they’ll work just as good for October, so be sure to reference them here for some fall fashion inspiration. I decided to break these up into two categories: casual and dressy. I’m also sharing some of the biggest fall fashion trends. From the color burgundy to fun shoe styles, I think you’re going to love this year’s trends! Animal print shoes are making a big comeback this fall. You’ll find animal print shoes in just about every style: sneakers, boots, flats, and heels. Amazon has a fantastic round-up of animal print shoes here. Do you own a pair of mules? Mules are the perfect balance between casual and dressy, especially when it’s too cold for sandals or peep toe shoes. Just like animal print shoes, mules are a big fall shoe trend right now. I’m 99% sure I’m about to order the wrap sweater pictured above. Wrap sweaters are so versatile. You can dress them up by wearing them with a pencil skirt or dress them down with jeans. They’re also lightweight enough to throw a blazer or denim jacket over. Break out those burgundy, mustard, and olive denim because colored denim is back. It’s a big fall fashion trend this year. One I’m fully embracing. There’s something about burgundy denim that I love so much. I think it’s because it’s a neutral that goes with just about everything, but it’s also a pop of color. It helps to break up the daily denim fashion rut we can so easily get into. How cute is this striped pullover? It’s from ROMWE, is only $13.99 and comes in several different colors. Wear it by itself or toss on a denim jacket if the weather gets cold. I snagged this outfit from my What to Wear to a Football Game post because I just love it! It works for a night under the stadium lights or the stay at home moms who want to be comfortable and stylish. It also works perfectly for running errands on the weekend. October can sometimes mean rain, depending on where you live. 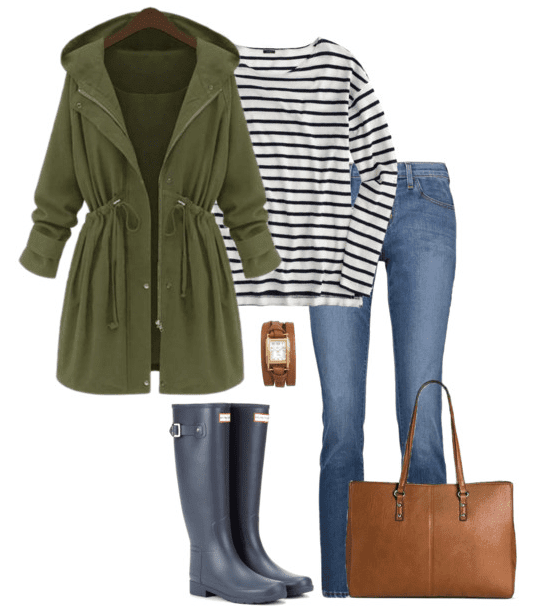 So bundle up with a utility jacket, striped tee and a classic pair of Hunter Boots. I wasn’t quite sure what the big hype over Hunter boots was all about…until I owned a pair. Now I get it. Oh, do I get it. If you have a pair of red Hunter Boots, check out this cute Valentine’s Day outfit idea. 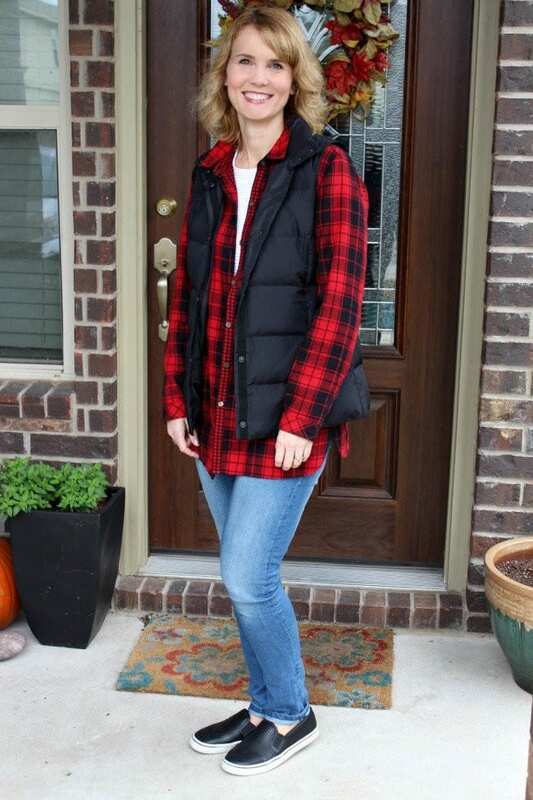 Get the outfit details for this red plaid shirt outfit, plus see 3 different ways to wear it here. 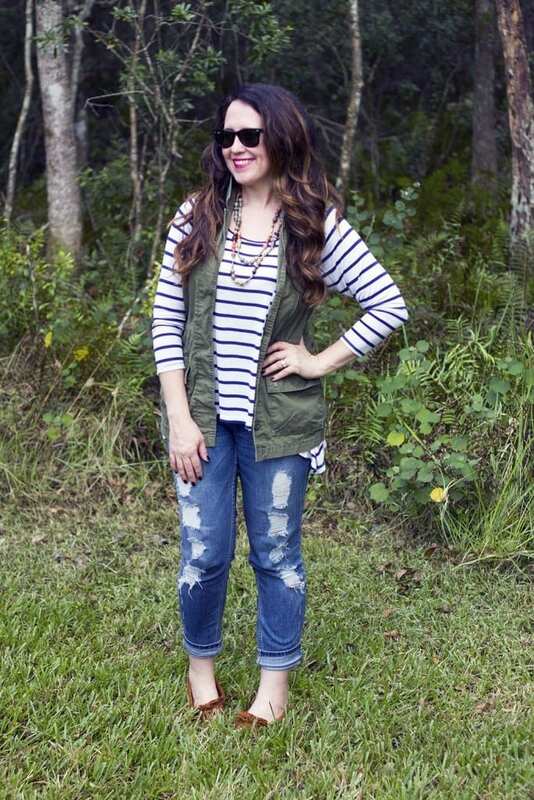 Kristin from Take Time for Style shows us how to style a military vest. If the October temps are too cool for flats like she’s wearing, switch them out for ankle boots. Oh! And be sure to enter her giveaway for a $150 Nordstrom gift card. I really like this look from Tiffani. She calls is Casual Camo. I ran from the camo trend for years, but have fully embraced it now. Pair a camo jacket or vest with your favorite tee, ripped denim and shoes for a quick “get out the door fast” outfit. Last year I called this outfit my Go-To Casual Fall Outfit and it still is! 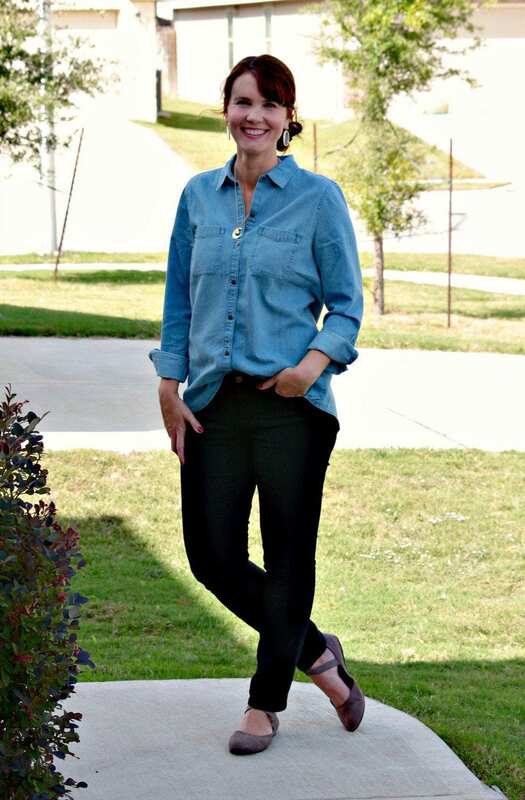 It doesn’t get much simpler than a chambray shirt, black denim, and ballet flats. Have you ever tried layering a sweater over a peplum top? It’s such a great look! I paired it with black denim, but you could also wear leggings if you so desire. Add a pair of animal print flats and some jewelry and you have a great look for the office. The camel sweater has puff sleeves which makes it just a bit dressier. This look isn’t for everyone, but this is a fantastic way to get a little more wear out of those summer dresses and skirts. Pair it with a sweater and block heels and you have a dressy (and warm) outfit. You could also add a moto jacket for another layer and to give it some edginess. Side note: Midi dresses and skirts work whether you’re on the shorter or taller side. It’s a great versatile length. Speaking of moto jackets, how pretty is this one paired with the dark floral skirt? Fall is the perfect time to break out those darker floral dresses, skirts, and tops. This checked poncho is a great piece to dress up your black denim and basic white tee. Add a pair of ballet flats and a cute handbag and you have an outfit that could work for the office or an occasion when you want to dress up the basics a bit. When it comes to layering pieces, it’s always a good idea for your t-shirt or top underneath to be a little bit fitting. If you start to layer bulky pieces on top of bulky pieces, the outcome won’t be very flattering. If you want a look that’s even more slimming, opt for a black top, black denim and a poncho. 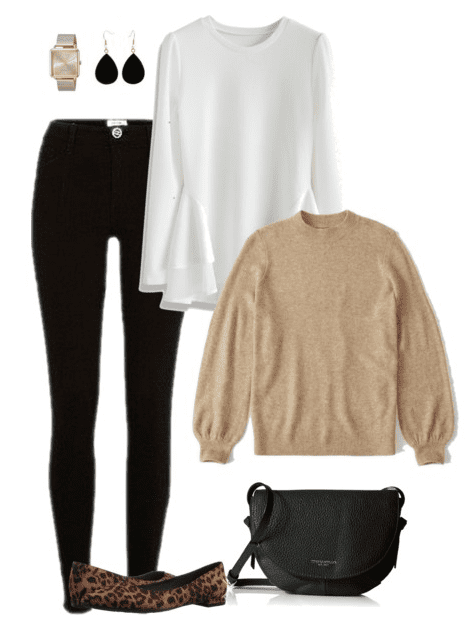 This outfit is so simple, yet so stylish. I love to take a black LBD, maxi dress or maxi skirt and pair it with a denim jacket. It gives a nice added layer of warmth and allows you to wear some of your items you might usually save for warmer weather. If it’s too cold for peep toe shoes, break out the ankle or tall boots. This is still one of my favorite fall dresses. See how I styled it three ways here. Did these October outfit ideas give you some much-needed inspiration? I hope so! Be sure to check out the What to Wear This Month page to find all of the months of outfit ideas. These are all very cute! I have a pair of hunter boots and unfortunately can’t walk any long distance in them, they are SO uncomfortable. I probably need to get those sock inserts or something. But I kind of wish I splurged on something else, as much as I love the look of them! That’s a bummer about your boots! I definitely think the inserts will help with the comfort level. Thank you for stopping by! So many great pieces! 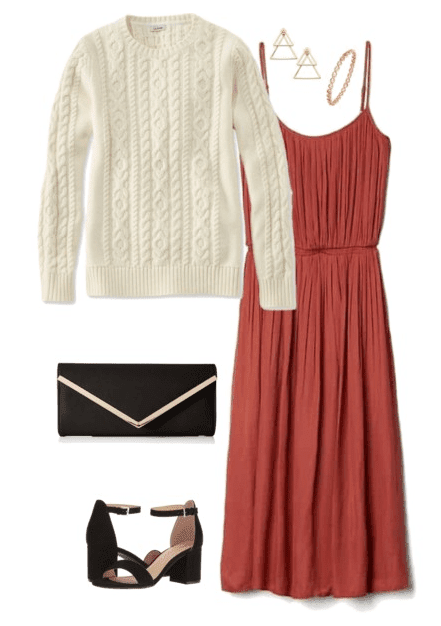 I love all of the casual outfits but also loving the idea of throwing a sweater over a dress like you suggested! 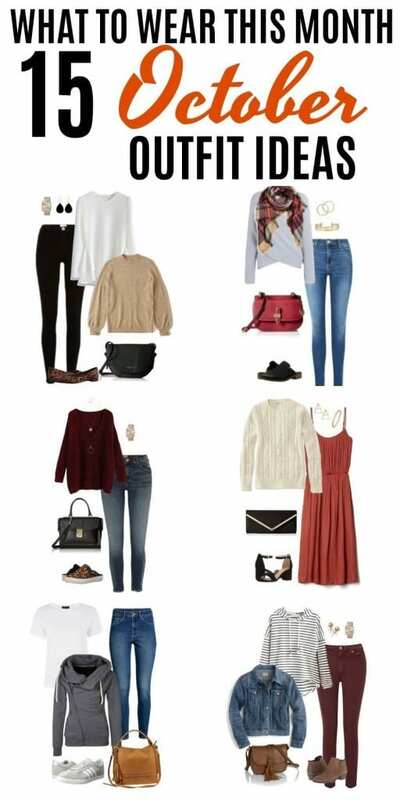 Love these outfits! Had to laugh at your go-to of black denim & chambray! That’s one of my go-to outfits as well! ? I really like the look of that gray wrapped sweater. But both links took me to a necklace? Great series! All these outfits seriously look amazing! I’m defiantly going to be trying to make something similar to a few of these! What a fun idea for a blog series! Thanks for sharing all your faves for October, it’s always helpful to see how others would style pieces. Loved so many of these outfits, especially the wrap sweater. When I click on either of the links for the sweater, it goes to a necklace. Any chance you know where the sweater originated? Thank you! Thank you so much for letting me know about the link! It’s been fixed. And I’m happy to hear you like the outfits!